This page is dedicated to all stores and chains interested in selling Alvarado Street Bakery products in their retail locations or distributors wanting to deliver our products. Please read on and find out more about our bakery, products, and wholesale process. We look forward to building a mutually beneficial relationship with your company. For nearly 40 years Alvarado Street Bakery has been leading the way in setting high standards for delicious, healthy, and organic whole grain breads. Our bread products are sold in quality stores across the United States. Some of the national chain stores include Costco, Safeway, Lucky, Whole Foods Market, Albertsons, Raley’s, and Sprouts Farmers Market. Customers can also find our breads in local retail shops such as Oliver's Market, Molly Stones, New Leaf Markets, Community Market, Rainbow Grocery and others. Alvarado customers are extremely loyal and are genuine fans of our breads, bagels, buns, and other food products. Many have enjoyed our breads since youth and continue the tradition with their own children. They are enthusiastic consumers who will go to great lengths to find a store selling our brand. It is common for Alvarado customers to ask for our breads in the stores they frequent. The consumers have always been and continue to be our greatest supporters! Denice Kagan asked us on Facebook "I so miss your bread! Moving to Nevada … do you have stores that sell your products in NV?" In California Karen Albanese Saunders asked "Where can I find Alvarado St. Bakery bread in the Simi Valley area?" On the East Coast Tamara Tuthill asked us after watching one of our videos "Hi all the way from Maine. Wow they all look sooo good. Can't make up my mind which one I want to try first. 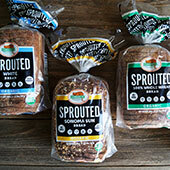 I would love to try the Sprouted Sonoma Sun Bread if I can find it in my area!" Our question to you is "Do you want your store to be the place to go for Alvarado Street Bakery breads?" If yes, call us today at (707) 789-6700 for an introductory conversation with one of our friendly team members. Since sprouted breads by their nature freeze and unfreeze very well, our products can travel long distances and still deliver excellent products to the end consumers. Alvarado Street Bakery sells its various products in countries like Mexico, Japan, Singapore, Kuwait, Puerto Rico, the British Virgin Islands, and the Bahamas. We are always welcoming new overseas markets whose consumers are looking for quality American-baked bread. Our international customers are diversified in types (businesses like restaurants as well as individuals), cultural backgrounds, and ages. 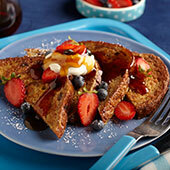 What all of our customers in and outside of the USA have in common is a desire for healthy and tasty bread choices. All love the soft texture and the nutty whole grain flavor of all of our breads. We keep the process simple and friendly. The first step would be to contact us by telephone at (707) 789-6700 Monday through Friday 9am to 5pm (Pacific Standard Time), by email at info@alvaradostreetbakery.com, or by use of our Online Form. Please provide your detailed contact information and if you are a retailer or a distributor so one of our sales associates can get back to you. After an in-depth discussion about your bread needs, your target audience, and your specific situation, we develop a plan which will enable you to carry the Alvarado breads on your shelves and help you generate additional revenue. 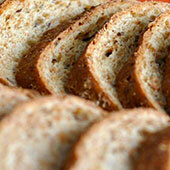 We will of course send you some delicious samples of our bread products to enjoy. Thanks to our dynamic fan base, you may be able to reach a brand new audience in your local market(s). Our products are distributed in the US and internationally through a network of professional distributors. Retailers are able to get our products through one of our distributors, many of which have been with Alvarado Street Bakery for many years. Based on the location of the delivery, our bread products are delivered fresh or frozen. We offer very quick turnaround time from your order to the actual delivery at your retail location. In addition, rest assured that we select our distributors very carefully, making sure they embrace Alvarado's culture of excellent customer service to vendors and consumers alike. To find out how soon you can start selling some or all of the 33 Alvarado bread products (with 8 upcoming new products! ), call our Sales and Marketing Team at (707) 789-6700 (Pacific Standard Time). Join these quality stores and start selling Alvarado Street Bakery quality organic and non-gmo breads!